Oh boy, this review is SO late it's shameful. No really. Embarrassing. But here's the thing..it's for nail wraps. So....I was afraid. The reason they took so long to review is two fold, number one was I was legitimately trying to clear a block of time that I wouldn't have to swatch so I could review the longevity of how long these would hold up. And the other reason, well...I was afraid that they would be a disaster on my nails like the last time I tried (Jamberry) wraps. This week begins my Digit-al Dozen challenge week for the month of May and our theme is "BLING". It dawned on me that these absolutely fit the theme, so finally I sat down and applied my Essie Sleek Sticks! Here's how to find out more info and see all the styles: Essie.com Shop wherever Essie products are sold, $10.25 MSRP. These "pre-cured UV appliqués mimic the feel of a handcrafted nail art and last up to 10 days." Keep reading for my experience with them. 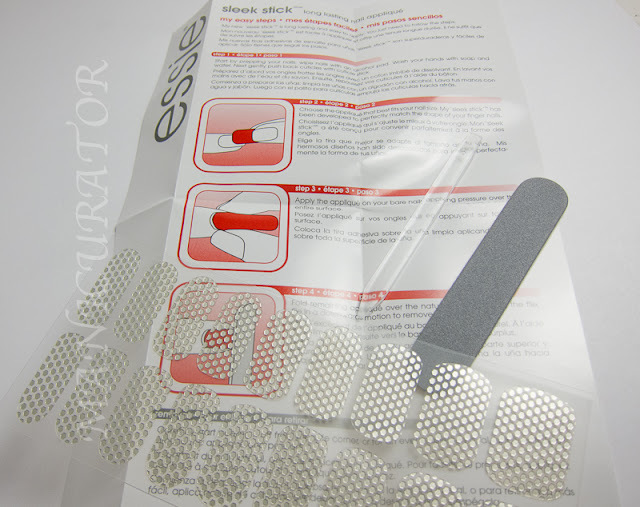 Each set comes with 18 appliques, a small plastic cuticle stick and a file/buffer. Instructions too of course. The instructions and procedure were really quite simple and easy enough to accomplish! 4. press on nail and file off the excess. I have quite a curve on my Index finger, which is where I had some troubles. You can see it buckles and doesn't lay flat in a few spots. I really tried to get it to lay flat, but it just couldn't handle it. There are one or two smaller spots like that on the other nails too. Which initially made me think these wraps weren't for me and my nails just aren't cut out for wraps. This particular style is on a clear background, so you could totally layer it over a color of your choice to customize it. They also say you can top coat over this, which I did not. I will try top coating next time I try these, and I certainly will try these again. These were a PR sample for review, but I would surely buy a set, because, like I said..they didn't fit flawlessly, but good enough that I'd wear again! Despite the little imperfections, I really loved these on my nails and they stayed on no problem for 3 days. 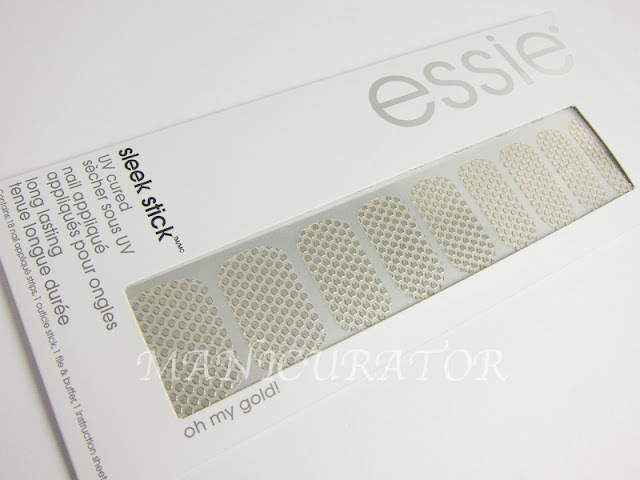 They probably would have stayed on longer but I had to get to the next swatches..
Have you tried Essie sleek Sticks yet? Did they work for you? If not, do you think you will try them? Be well and don't forget to have a look at the other talented ladies for Day 1 of Bling Week! These are so cute! I don't usually get interested in nail wraps, but this is definitely something I wouldn't do on my own. Quick question...are those your natural nails? BTW, the wraps look great! I have very small sized nails...even when they are long. Are there small enough wraps for narrow, definitely not flat nails? Hi Suzanne, I believe so, but if there aren't, you can easily cut them to a size that fits. Thanks Erin! You think you'll try these one day? I was actually just wondering how you have kept the nails in good shape. My nails are normally in great shape, but a couple of months ago they were breaking a lot, can you recommend a good base coat? Kim, I don't prefer one base coat to another, and I don't use a treatment base coat. I do oil my bare nails on a regular basis (EV olive oil or argan oil) and only use a glass file. Hope those help! These look amazing! I kind of wish they had a dark background though, like navy, to really make the 'sequins' pop. Hi Bailey, You can paint a navy polish and apply these on top! Do you think? I thought of that too, but I wondered if that would 'mess' with the adherence of the wraps. I have had terrible luck with nail wraps in the past, I'm so envious of ladies with nice, flat nails. After your review I might just give these a try! They look fab on you! Would be fun to see them with a really bright white french tip or over a black holo. You are so right....these are HOT! I must have them. Like seriously. Hi Stacy, my nails are far from flat! And keep in mind..these weren't perfect on my nails, still had some small crinkles, but they overall work and look great! I love all the Sleek Sticks styles, all so classy, right? They are indeed hot and gorgeous. Always care most about your family's contentment as well such as your environment. A metal is especially used in armor-piercing projectiles. first class villa. Though antiquing isn't your speed, come concerning the great dinner choices. Crucial to you . bungalow houses were quite small in support of a single storey in height.